McIntosh has announced a trio of new two-channel preamps. The premium model is the two-chassis C1100 (shown, right), which consists of an independent controller unit and a preamp powered by 12 vacuum tubes. Each chassis will carry an asking price of $6,500. McIntosh also unveiled the C52 and C47 preamps, priced at $7,000 and $4,000 respectively. McIntosh is proud to announce the launch of three new preamplifiers--the C1100, C52 and C47. Handcrafted at our Binghamton, NY, factory, each product combines the best-in-class audio performance of the legendary McIntosh Reference System with the latest in technological development. The C1100 preamplifier brings a new level of performance and luxury to McIntosh's heralded preamplifier offerings--evidenced by its high level inputs having the lowest noise of any McIntosh preamplifier ever produced. It utilizes a two-chassis design where the control and power sections are completely separate from the audio section. Absolute isolation of a preamplifier's two main functions--control and sound--is achieved by this unusual but effective design and will provide the purest sound reproduction possible for generations of listening enjoyment. The C1100 is comprised of the C1100 controller and the C1100 vacuum tube preamplifier. Inside each, the left and right channels are electrically and mechanically isolated from each other to allow true dual mono operation, resulting in the ultimate stereo separation and sonic purity. The two units are connected together via a pair of specially designed, high-performance umbilical cables that are shielded to prevent outside noise from leaking into the audio signal. While they are two separate units, when connected they act as one and are easy to control and operate from the included remote control or the C1100 controller front panel. Both units' chassis are comprised of polished stainless steel and hairline brushed black Titanium stainless steel, offering a new degree of richness and refinement. All power control, data ports and external control connections are located in the C1100 controller; the introduction of a dual microprocessor allows for an improved robustness of the control system. The C1100 vacuum tube preamplifier houses the audio connections and circuitry, featuring a total of 12 analog inputs: six balanced, four unbalanced, plus an adjustable loading Moving Magnet and a Moving Coil phono input. For outputs, two sets of balanced and two sets of unbalanced connections provide flexibility in connecting to your amplifier. Twelve vacuum tubes (six each of 12AX7a and 12AT7) power the tube preamplifier. Compared to the previous generation C1000 preamplifier which had eight tubes, the additional four tubes in the C1100 lowers its dependency on any solid-state support. The amplifier circuit has much higher common mode rejection, so any noise introduced by interconnect cables is significantly reduced. The C1100 preamplifier employs fully balanced circuitry to match the level of performance achieved in any of our Quad Balanced amplifiers. The C52 is the most advanced, single-chassis solid-state preamplifier we've ever made. Thanks to its 16 inputs, this feature-packed stereo preamp lets you connect virtually any of your analog components and digital music sources to one easy-to-use device to enjoy them all. The versatile and exceptionally valued C47 (shown, right) lets you enjoy your music the way you want with its 12 inputs. Both the C52 and C47 play many of the latest high resolution digital formats, including DSD files. For connecting sources, the C52 includes three balanced and four unbalanced fully assignable inputs, plus three optical, two coaxial and one USB input. The C47 has two balanced and three unbalanced fully assignable inputs, along withtwo optical, one coaxial and one USB. Both also include one Moving Coil and one Moving Magnet phono input. The optical and coax inputs on each unit will decode digital music at up to 24-bit/192-kHz for high-resolution audio playback. For outputs, the C52 has three pairs of balanced and unbalanced outputs; the C47 has two pairs of each. Both models are capable of decoding and playing back DSD files for the latest in high-fidelity performance; the USB input accepts PCM signals up to 32-bit/384-kHz and supports DSD64, DSD128 and DSD256 plus DXD 352.8kHz and DXD 384kHz. In addition, a proprietary MCT input on each offers a secure, custom DSD connection for playback of the high-definition audio found on SACDs when paired with the McIntosh MCT450 SACD/CD Transport to extract and deliver the purist possible sound quality from your CD library. All inputs are available all of the time on each unit--even if you assign certain inputs to certain devices, giving you more freedom to configure your system the way you want. The outputs have also been updated to be easier to operate when bi-amping or tri-amping so that your highs and/or lows are not inadvertently turned off. The C52 offers an eight-band analog equalizer that allows you to fine tune your various music sources just the way you like, while the C47 includes bass and treble tone controls. For personal listening, all three models include a headphone jack with our Headphone Crossfeed Director (HXD) circuitry that brings a new depth and spatiality to your music. The Home Theater Pass-Through feature allows for seamless integration into your existing multi-channel home theater system. With classic McIntosh black glass front panels, blue meters, knobs, stainless steel chassis, illuminated logos and custom machined brushed aluminum end caps, all of the preamps make a visual statement in addition to their audio prowess. Any can be paired with a variety of McIntosh amplifiers, speakers, room correction devices, CD players, turntables, tuners and other source components to make a complete home audio system. 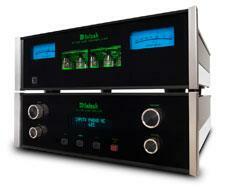 • McIntosh Announces MC75 Vacuum Tube Amplifier at HomeTheaterReview.com. • Visit McIntosh's website for more product information.